As a Premium or Unlimited subscriber you can add an image to your review requests that are sent via text. 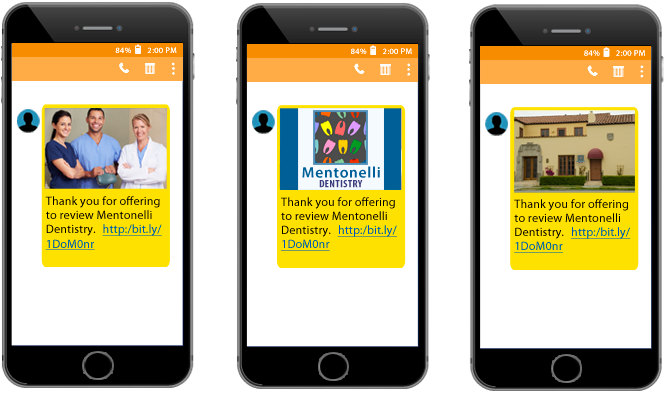 Customizing your photo lets your customers know at-a-glance that the text message is from you, someone they trust, resulting in a higher open rate and more reviews. It’s also a great way to promote your brand. MMS Review Requests Are Picture Perfect! If you’re a Premium or Unlimited subscriber your text messages are currently being sent using the default graphic shown above. The default graphic is more effective than the text only message, but it’s not as effective as it could be. For the best results, choose a customized photo representing your business. Choose your photo carefully and make sure that it reflects the elements of your brand that you want to emphasize. Staff photos and photos of yourself emphasize personal relationships and allow customers to feel that they know you little better. Images of your logo promote brand recognition and professionalism, while a picture of your building or office interior may be instantly recognizable and show that you’re a proud part of the community. Once you’ve decided on the photo you want to use, here’s what to do next. Upload your photo or graphic. Click the Save button at the bottom of the page to save your work. If you have any questions about this feature or if you want to upgrade to the Premium or Unlimited service to take advantage of this feature, please give us a call at 808-891-0449. We’re happy to help.